With my 8 years of experience in the industry, I understand the emotional and financial investment couples face when selecting their wedding vendors. That’s why I invest the time to understand my client’s needs, tastes and desires and encourage them to do their homework before they sign on the dotted line to engage my services. In the instance of my bride Christina, her planning journey started in the early months of 2018 when I received a Facebook message inquiring about my services. She wasn’t yet ready to make a commitment, but checked in with me a few times over the next couple of months to see if I still had her date available on my calendar - it remained open. The stars finally aligned for us in late June when we had the opportunity to meet over coffee – I instantly adored her.. and not only because she had her large planning binder in tow! We discussed details, expectations and hopes for the big day. I fell in love with her vision, excitement and chosen venue (which I will get to later), and my heart was hopeful that the feelings would be mutual. I was so pleased to discover that they were, as a few short days later I was officially asked to onsite coordinate as #thebarkersthaitheknot. While Christina and Ian reside in Toronto, they initially weren’t certain where they wanted their wedding to take place. It took numerous searches and site visits to here, there and everywhere before finally deciding on their venue. Funny enough, it took them back to the place of Christina’s youth (a touching although unanticipated outcome), and this city-loving couple fell in love with the idea of a country wedding. So their venue would end up being Northbrook Farms, a private residence nestled in the outskirts of Orillia with the most romantic of settings for their outdoor nuptials. Christina and Ian selected vendors both locally and from the city to carry out their vision of a “country-chic” wedding. Northbrook Farms offers an abundance of amenities. One stunning detail is their onsite tent which boasts high ceilings and removable sides which allow for a scenic view of the property. Playing off the natural light of the tent and the dark contrast of the harvest tables, the couple added a palate of blush pink with accents of greenery throughout their chosen linens, centrepieces and signage. This elegant, stylish wedding included a 24 ft long head table adorned with a sparkly blush sequin linen, framed by a lush chiffon backdrop and suspended chandeliers to give it that extra wow factor. Their organization and attention to detail. Everything was cohesive and carefully thought out, a wedding planner’s dream! 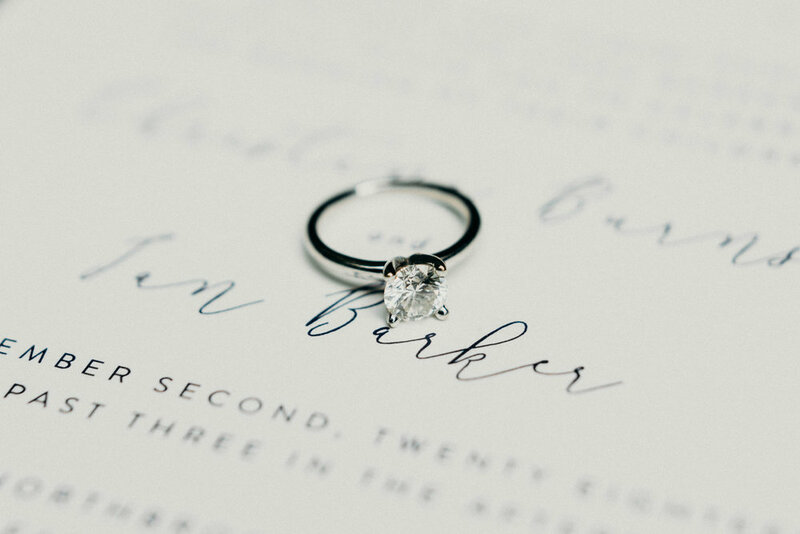 From the script of their invitations, to the labels on their wine bottles, menus and place cards (items often overlooked), all were harmoniously streamlined with the same elegantly romantic font. The event itself was flawless - full of love, laughter, amazing food and a heavily stocked bar! This group knew how to have a good time, as was evident early on in the evening when it came to explaining the newlywed kissing game - a first for me. Guests would battle the bride & groom in a flip cup match, and the losing pair would have to kiss. Other notable highlights were the garter toss during which the groom channeled his internal Magic Mike by putting on quite the performance to Genuwine’s “Pony”. Late into the evening, Little Red Catering would turn their onsite kitchen area into a pop-up food truck, offering an assortment of hot food sure to cure those late-night cravings. And in a true fairy-tale ending, the bride & groom were sent into the night as guests lined the pathway with a sparkler send off. The thing that stood out most for me (and trust me there is so much), was their ceremony, it was beautiful! Aside from the stunning views and decor, it was the actual words that were spoken that still gives me goosebumps when I think about it. The couple made one heck of a decision hiring Mark Allen Groleau of Unboring!Wedding to officiate. Boy, can he tell a story! He took the guests back to the beginning of Christina and Ian’s journey as a couple - from how they met through to the proposal (which, by the way, took place while touring the Colosseum in Rome…swoon!) and their vows… I am reminded of Ian’s words exactly “I will love you for who you are today and for who you will grow to become – and I promise I will never forget this privilege, no matter how many years of our life go by. Christina, you are undoubtedly the one for me, my true love and my best friend” ... There wasn’t one person in the room – vendors included, that wasn’t completely invested in this couple. So, to Christina and Ian, Thank you! Thank you for taking time out of your special day to let me know how much you appreciated my efforts, thank you for trusting me with bringing together your vision and allowing me to come along for this journey. Most importantly thank you for reminding me how lucky I am to have such amazing couples invest in me. May your best adventures be yet to come!